People take landscape photos for a variety of reasons. At a personal level, I know that my motivation is constantly changing. Today, landscape photography is a great way to be outdoors. Tomorrow, I’ll spend a rainy day editing the photos I just captured. Digging deeper, though, there are more fundamental reasons to take landscape photos, and they all have to do with your outlook on the world. To see if you’ll like landscape photography, there’s a simple question that you can ask yourself: are you a creator or a consumer? If you are a consumer, your life is all about experiences. In your free time, you might go on a hike, watch YouTube videos, read the news, or watch a movie with your friends. If you are a creator, you spend your free time laying a trail, filming YouTube videos, writing the news, and directing a movie. No one is solely a creator or a consumer. We all do both — and, to survive, we have to. For your job, you’re being paid to create things. (Even film critics, who spend a lot of time watching movies, generate ideas.) At the same time, everyone consumes things like food and water, along with education. Simply by reading this article, you are a consumer. So, when you ask yourself if you are a creator or a consumer, the point is to see what you are drawn to do. If you had ten hours to do something, would you create or consume? Landscape photography, more than almost any other discipline, stands directly on the line between creating and consuming. Landscape photographers love to create things. They love to compose photos, edit them, print them, and show them to anyone who wants to see. At the same time, landscape photography is about having experiences. It’s about being in the middle of nature and soaking up everything around you. Landscape photography takes your experiences — what you consume — and repackages them for other people. When you click the shutter, you turn from a consumer to a creator, then back again. So, landscape photography is for those people who don’t really fit into either group, and for people who aren’t yet sure. Yes, everyone can enjoy landscape photography, but the photographers who really stick with it almost always straddle the line between creator and consumer, doing both of them almost equally at different times. I have always been fascinated by fields that combine art and science together. One of my first hobbies was creating tiny origami figures by folding a sheet of paper — a type of art built upon geometry and mathematics. Landscape photography is the same way. When you take pictures, you need to have some technical understanding of how your camera works. You need to analyze the scene in front of you, noticing details that other people will overlook. And, at the same time, you must be creative. Every time you frame a photo, you should keep in mind what looks good and why. These questions are impossible to answer with facts alone. These two different mindsets — analyzing the scene, then making creative decisions — are both critical to successful landscape photography. It’s not as if this is the only field that combines arts and sciences, but the degree of each that you need in order to capture the best possible photos is impossible to ignore. Some people are good at artistic thinking, and other people are good at technical thinking. You might have heard that this distinction happens because your brain has two different hemispheres: one creative, and one logical. The first type of thinking — creative, artistic, and innovative — is said to live in the right hemisphere of your brain. Right-brained people are visionary and spontaneous. Once again, though, landscape photography is directly in the middle. When you use your camera, you need to have a logical understanding of its important settings and features. Then, when you compose a photo, it’s time to flex your creative muscles. Landscape photography exercises both sides of your brain. It requires creativity and analytical skills simultaneously, and each is just as important as the other. So, if you find yourself drawn equally to both ways of thinking, landscape photography will be a good fit for you. It requires a ton of creativity, but you also need a firm understanding of the technical side of things in order to execute the image in your mind. Some people love this, including all the landscape photographers I know. 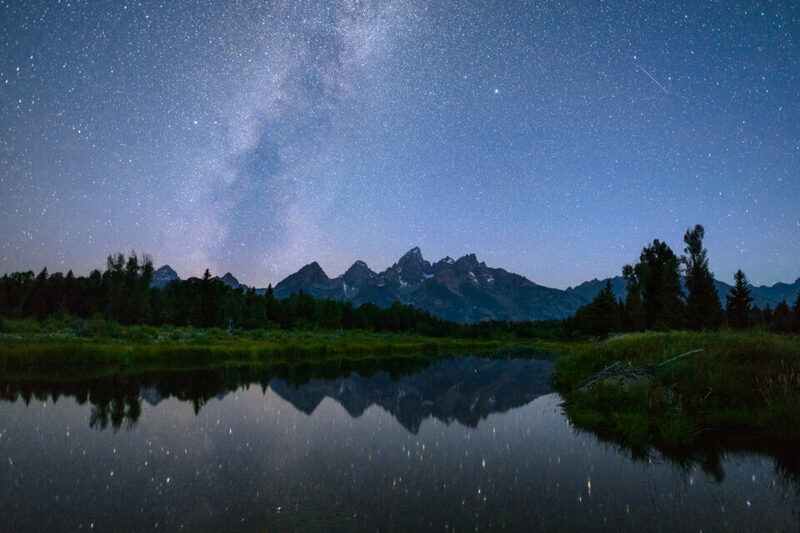 There’s nothing more rewarding than photographing the Milky Way, but it does take some technical know-how. People take landscape photos because they want it all. They want to be creators and consumers at the same time. They want to exercise both halves of their brain simultaneously. Maybe they can’t decide what works best for them, or perhaps they’ve decided that everything works best for them. Does this sound like you? Landscape photography is a wide genre of art, and it means something different to everyone. For me, though — and for almost everyone I know — we take landscape photos because it is simply fun. It lets you experience the planet at its most beautiful, then use your logical and artistic knowledge to create something amazing. If that’s not a good reason, I don’t know what is.